Last week, HipHopDX caught up with longtime Wu-Tang producer Mathematics — the man behind the LP — to discuss his state of mind while creating the new project and to give fans a sneak peek of what’s coming on October 13. 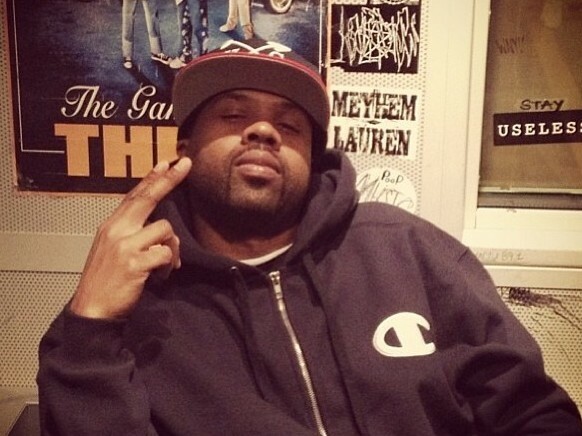 HipHopDX: Wu-Tang: The Saga Continues! RZA called this a masterpiece. What can you tell us about this album? Mathematics: I put a lot of hard work into it. Definitely worked hard to make it a masterpiece. When I was putting this album together, I was basically trying to put together an album that when I listen to it … I’m real critical of myself. I’ve done other projects in the past and as I did those albums, I always listen back like, “Aw, I wish I would have did this, I wish I would have did that.” Plus learning so much now and being able to put it into effect, I just try to put together a complete album, beginning to end. You have a lot of people who are all about singles. I’m not from that era even though I exist in it. When I get albums, I wanna hear albums I can rock to from beginning to end, all the way through. So, that’s what I was trying to do. And in order to do that, you have to create something that’s … it’s gotta be a masterpiece. DX: Did Ghostface spearhead the creation of this album? Mathematics: No, not this particular album. I know Ghost was on record saying, as far as RZA putting him in charge of putting together a Wu-Tang project, I know Ghost is still working on that. It’s like, we all work. And Ghost has a track record of putting together great albums. From Ironman, Supreme Clientele, Bulletproof Wallets — a lot of people will say that he’s the most consistent within the Clan. And he does have an ear as far as music goes. And one thing about me and him, we like a lot of the same songs. But this particular project … Basically, when we was doing A Better Tomorrow, me and RZA had a discussion. ‘Cause I think at that time, he kind of seen where I was going with my music. I been around for a long time. I’ve been a student for years. Coming up in the ranks, you have 4th Disciple, you had True Master, [Inspectah] Deck is an incredible producer as well. You had other producers that came and went. But as far as Wu-Tang production, the top producers were RZA, True Master and 4th Disciple. Now, they had a head start on me far as production wise. When I did get into the gate as far as production, it’s like going into the studio … you know I seen it as far as the emcees, as far as Meth, Dirty, GZA — you couldn’t get into that booth unless you was ready. And when you got into the booth, you’d better came with some hard lyrics. You better came with something. If not, it was like… a lot of lyrics didn’t make the album. [It’s] the same thing with production. When I came in with production, I was able to get my one, two’s off. I was able to get my “Publicity” in, and my “Mighty Healthy,” “Wu-Banga 101,” things like that. I learned from competition. It’s always been competition. It’s like inspiration as well. Going up into the studio and hearing a crazy brother come off a crazy beat. I remember when I heard True Master come up with “Fish,” I was like “Oh my goodness.” So, it’s inspiration. Basically, I could say I actually perfected my craft with this album here. This album is me, 100 percent. As I went along in stages, I brought it to RZA so he could hear and critique it. He gave me the simplest advice — it was like the little things that really helped me shape and form this album. And one of the emcees that really came through on this album and who was there from the beginning, I gotta say is Method Man. He definitely inspired me, too. Meth, I know he’s doing his acting, movies and TV shows. But when you hear this, lyrically, Meth is killing it. DX: I heard while you were making this, you were inspired by The Chronic 2001 and also the first Wu-Tang project. What mindstate were you in? Mathematics: Well, when I first started doing this project, I listened to two albums. And those were the two albums I listened to. Usually when I start a project, I listen to certain albums for inspiration. I would listen to albums like Illmatic, Ready To Die, Chronic was in there, a lot of our albums. I used to listen and listen and psych myself up, get inspired. But I said you know what, my two favorite producers [are] RZA and Dr. Dre. And to me, those are two classic albums. So I said instead of going through all that, let me listen and really critique and study what they did on those albums. After I listened to those two albums, that was it. I didn’t listen to no more music but my own music. If I did hear music, I heard it when the kids was playing something or if I get into the car. But most of the time, I kept my headphones and I put all my work on my phone. So, I had my headphones and I was just listening to what I was doing. I was in my own bubble. And that’s what really helped me to create this. DX: Is it officially Wu-Tang? Especially in light of the questioned authenticity of the “Wu-ness” of the album that Martin Shkreli owns? Mathematics: [laughs] You know, the Shkreli … I’d say that’s official Wu-Tang, too. You might have people say different things, but I’m not going to get into that. Me myself, I am — whether people realize it or not — I am Wu-Tang. I’m a part of Wu-Tang. I’ve been there since the beginning. I created the Wu-Tang logo. DX: I was going to ask you about that. How do you feel about Hip Hop heads — everyone rocking that hoodie and seeing that logo everywhere. That’s your work right there! Mathematics: It still bugs me out to this day. It’s surreal to me because it’s like, “Word, I did do that! I actually did that!” I had no idea that it would be this big, as far as the tattoos, t-shirts, hoodies and clothing. And people just wearing it who may not even know who Wu-Tang is. DX: What are your thoughts on Shkreli selling his copy of Once Upon A Time In Shaolin? Mathematics: He paid for it, he could do what he want with it. DX: Have you heard it? Mathematics: I’ve heard it, maybe. I can’t say if I’ve heard it in its entirety all way through. DX: Any exclusives you can share about Wu-Tang: The Saga Continues? Mathematics: I want everybody to basically really get this album and listen to it. Like, Wu-Tang has a mystique. So you think of Wu-Tang and everybody really loves the early days of Wu-Tang: 36 Chambers, Cuban Linx, Supreme Clientele. Sometimes with progression, as far as musically, it goes a different direction because you grow sometimes. And sometimes, you may outgrow certain people or certain things, but this particular album for me, I wanted to get back to the raw essence of that. So that’s why I listened to 36 Chambers. But at the same time, the uniqueness of 36 Chambers was that it was so gritty and grimy, too. But then as far as me being a DJ and me deejaying in the club, you throw on something like “C.R.E.A.M” after you throw on certain records, it’s like the frequency … it’s like you hear the difference. You still love it, but sonically it’s a little different. So that’s why I listen to The Chronic 2001 because to me that is sonically one of the best albums ever. Just like 36 Chambers, you can listen to it from beginning to end. I wanted to capture that sonic and keep the grittiness. So that’s what I was able to do and capture in this. I really want people to get this album and listen to it because Wu-Tang fans are so critical. So I really want them to hear this because I put my heart, soul and passion and everything into this right there. I do that with all my work, but really with this one right here. I really wanna showcase what I can do now. Mathematics: Whoa! Whoa! Whoa! It depends on the day now. But that’s today. Tomorrow it might be Cuban Linx, the next day might be Liquid Swords. But Cuban Linx is always in my top three as far as Wu-Tang solo albums. It could be number one — I just love that album. Not to say that I don’t love all the others, but to me, out of all the albums … in the beginning, for one, the sound of it — I love the sonics of that album. I love the soulful [sounds]. Everybody was just coming with it as far as lyrically. I just enjoyed being a part of that album and making that album with everybody. You can hear it. DX: Drake came out with that “Wu-Tang Forever” tribute. You guys got collab coming? Mathematics: I don’t know. I would love to work with Drake. DX: Is there anyone you want to collab with in the near future? Mathematics: I just love to work, so anybody who wants to work, I’m down. I’m a fan of Hip Hop. Nas is definitely one dude I’ve always wanted to work with just because … I’m from Southside, Queens. And he’s a Queens dude. He’s just an ill lyricist to this day. Nas is just Nas. Just on some New York, Queens type vibe: 50, Lloyd Banks. I like Westside Gunn and Conway too. Them dudes is dope. There’s a lot of dope dudes out there. I’ve worked with a few. Termanology, he’s a dope emcee. If you want to work, let’s work. Let’s get it in. I have a passion for music. And I think Wu-Tang: The Saga Continues, when people hear my work right now and what I’m doing, hopefully they’re attracted to it and they want to work. And we can keep it going. DX: So, who are you listening to today? Mathematics: The Saga Continues. [laughs] But today, I think it’s a little too far and few as far as Hip Hop goes. Hip Hop has expanded, so it’s a lane for everything. You still got J.Cole, Kendrick Lamar, Vic Mensa, Vince Staples — you have dudes that got lyrical talent. But, I would like to see more originality. Me being just a Hip Hop fan, not taking nothing away from what anybody else is doing ‘cause music is music. If it’s good, it’s good. Even right now, I like Cardi B’s joint. Honestly, She killing it. I listen to everything. If I like it, I like it. If it’s good music, it’s good music.